We sure do love an all white event. We are a sucker for a classic look as it allows us to concentrate on details and textures that we love. But there is always room in these classic color palettes to add a little touch of the unexpected. In the wedding industry we see blush all the time. But have you seen in at an event, private dinner or Holiday party? It’s a rare day. So we though we would bring you inspiration on how to add a small touch that won’t send us to the super feminine side and yet give an all white table scape a bit of a facelift. Here are three easy ways to add a touch of color to your holiday party. 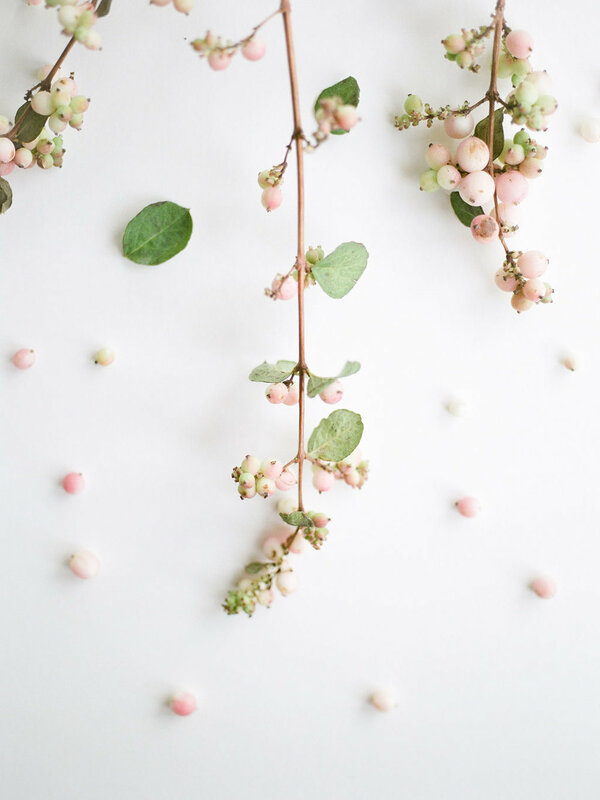 We created these arrangements in all white and green and allowed the accents of berries to be in blush. This snuck in the color with out overwhelming the color palette. We also added an unexpected blush/copper texture that we then used through out the decor. These sprayed fern were such a beautiful touch that we then manicured for the place settings. There are so many color palettes that are not able to be created due to availability of flowers, or even quality of the product we receive. Candles are a guaranteed splash a color that can be added with no fuss. Add a fabric overlay via a table runner of soft fabric that can be placed over the table. Adding a layer of fabric on top of the linen helps create an ethereal look that we love. It’s soft and romantic and allows us to add that touch of color. For this specific look we bunched up areas while also allowing the fabric to gently hang of either sides, the front and the back.